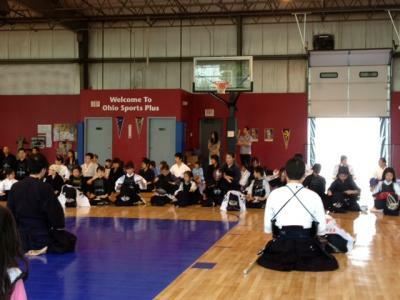 We meditate before and after practice in kendo. In shout "Shisei wo tadashite,Mokuso! (with a positive attitude, meditation!) , everyone close your eyes lightly. Keep your back straight, pull the jaw, and make relaxed your shoulder. At this time ,hand makes a circle around the belly button,called "Tanden" ,putting the left hand on the right hand. Breathe in breath from a nose and keep it in the stomach ,around "Tanden" and discharges all the breath of the lungs from a mouth slowly. Continue this behavior until the word of command "Yame! (Quit)"
● Why do you do "Mokuso"? By making this breathing with our eyes closed before practice, we can calm down and switch the feeling to focus only on kendo. Also, the practice after, we can consider the reflection point and look back on the practice of the day . we will continue to progress without being instructed to do the same in practice next. Meditation is also useful when you need to concentrate on and study as well as kendo. We can calm down in a short time by meditate and make to focus thinking only one thing. Today, we will talk about yuko-datotsu -- valid striking and/or thrusting to get one point ("Ippon" = one point). Simply speaking, a stroke or a thrust is regarded as yuko-datotsu when you strike the right part of the other competitor's body with the right part of your shinai, with the right way of swinging your shinai, and with the right posture and vigorous, aggressive spirit. You should also show your alertness to intercept the other's attack even after you gave him/her the stroke. 1 -- Fully courageous Ki-se-i is roughly the same thing as Ki-a-i,the state of concentration with fighting spirit. You are supposed to strike the other competitor's body with a very powerful shout. When you hit the other, you need to say "Ko-te (wrist) !," "Men (head)!" or "Doh (trunk)!" in a loud voice at the same time. In doing so, you can fully release your power with Ki-a-i. 2 -- Your stroke will not be counted as Ippon if your posture was badly unbalanced. 3 -- "The right datotsu part of shinai" means the part 1) between a shinai's tip and its leather strap placed approx.15 cm from the tip (naka-yui) and 2) on the opposite side of your shinai's string. This part is also called Mono-uchi, and it's believed to represent to he portion of a blade most appropriate for cutting. If you hit the other person with the part of your shinai other than this part, you cannot gain an Ippon. 4. -- "The right datotsu part of the other's body" includes Kote (wrist), Men (top of the head), Doh (left or right side of the trunk) and Tsu-ki (thrust against the other's throat). Competitors who are high-schoolers and up can make Tsu-ki, but other minors are not allowed to do so in a Kendo match. 5. -- Shinai follows "the right path" when the blade side of your Mono-uchi rightly follows the path that an actual blade of a sword should follow. "Blade side of a shinai" is the side opposite to the shinai's string. If this side is not facing the direction of the swing to hit the other, your stroke cannot be regarded as yuko-datotsu. 6. -- "Zan-shin" means to show your physical and spiritual alertness even after delivering a stroke or thrust, so that you can intercept the other's counterattack. In order for your stroke to be counted as yuko-datotsu, you should not just hit your competitor, but also face him or her with full alertness until your match is over. Let's practice suburi and uchikomi being aware of these points, so that you can make a truly valid yuko-datotsu. Today, we will discuss the rules about what you are not allowed to do during a Kendo match. When you break these rules, your play will be considered a foul. If you committed two fowls, your competitor will get one point. 1) One of your legs getting out of the court. If any part of your body (such as your leg, hand or bottom) got out of the court during the match, you have committed a foul play. Whatever the reason is , if you dropped your shinai, you have committed a foul play. 3) Grabbing the blade part of the shinai. Whether it's your own shinai or the competitor's shinai, if you grabbed the blade part of the shinai during the match, that would be counted as a foul. 4) Forcibly pushing your competitor out of the court. If you forcibly pressed your competitor out of the court, say, by pushing him/her or by thrusting him/her with your shinai, you have committed a foul play. Touching the blade part of your shinai will be regarded as a foul play, unless you have called the judge to request a time-out to do so.